See "Limit button to conflict" option in configuration. As for your recipe, could you tell which mods you have that made the recipe conflict? Thanks, that works nicely. Could the "Limit button to conflict" option be on by default? It looks like the conflict is from the Rustic mod, it adds a second shovel recipe. When the conflicting recipes result in the same item, can you remove it from consideration? I never knew how much I relied upon your mod for my mod packs. I thought that with the crafting book being added to minecraft it would remove the need for this mod, however it is not so. For Instance, IC2 and Tech Reborn, both have carbon fiber and there is a conflict, that only the tech Reborn one shows up in the crafting book. I know those mods are not your problem, I just think it's crazy how they add the crafting book, but it still can't handle recipe conflicts, and your mod gets it done flawlessly. Just wanna say thanks for this mod, and as everyone else i'm waiting for 1.12, or 1.12.1. Also it would be great if you could just work the code into the crafting book so there is no need for anything else on the gui, maybe that's what you're doing, idk but it would be great. 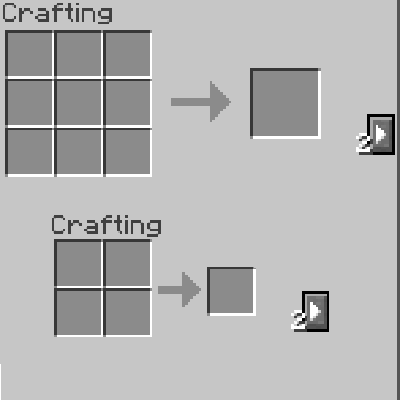 If you do update this mod to 1.12, can you make it so that the button to change crafting was moved off to top of the crafting box instead of the side so it doesn't run into jei functions. Any chance of any update soon please? Thanks! any hcance of a 1.12 version could really use it with my modpack? I just tried the 1.11 Release NoMoreRecipeConflict-0.8 with 1.12 modpack. The modpack did start up just fine. Had 143 mods, added this, then it said 144 mods. Edit: Crash upon trying to change recipe. Maybe still will need 1.12 update. There is a crash bug in 1.11.2 (0.8) when clicking on the button while holding an item. This was in an Ender Utilities Handy Bag, but it might happen other places as well. It only happens when holding an item. the 3 buttons for rotate/balance/clear, when you open up a refined storage crafting grid, block off the bottom row and hotbar smack dab in middle. I changed config's horizontal to -200 to see if I could get them to move out of the way and it didn't budge. Can we have a config option to disable those three buttons? I don't even use them, like ever. It would be nice to have this option to avoid these kinds of compatibility issues when they arise. In addition, any chance to get your config options implemented in mod options so you don't have to restart the pack to see results? I think those three buttons are from the Crafting Tweaks mod, not this mod. I apologize if this has been asked before, but are there still bugfixes happening for the 1.7.10 version? I ask due to the compatibility bug with the Tinkers Crafting Stations, Tinkers is still a widely used mod and it's part of a lot of the 1.7.10 modpacks such as mine, I know an easy fix would be to just create a normal minecraft crafting table but it would be handy to not need to do that and be able to utilize the crafting stations I currently have. Once again my apologies if this has been asked before. Hello GotoLink, Would it be possible to have Minecraft Recipes take priority in the crafting recipe list? For example when making a chest the first recipe listed would always be the Minecraft chest followed by the rest of the modded crafting recipes. Secondly would it be possible to craft a stack of items at a time without the recipe defaulting back to the beginning of the list of possible recipes?